For every additonal car insured at the same address for drivers over 50, you will receive a multi car discount. 8 hours, 38 minutes left! Where do I use my Saga Car Insurance voucher code? Put all cars in the household driven by over 50s on to your policy to receive an additional discount. Saga Car Insurance is designed especially for drivers aged 50 and over, and has earned recommendations from Which? for its excellent comprehensive cover, starting at just £133 per year. Receiving a quote online is quick and simple, and as part of your policy, you’ll receive EU cover, cover up to £500 to help you get home following an accident, vandalism cover and a replacement car for up to 14 days at no added cost. Our Saga Car Insurance discount codes will help you get the best deals on coverage, with additional options like reduced-cost Saga Breakdown Assistance, legal protection and more. If you're over 50 and looking for a quote on affordable car insurance then be sure to choose Saga Car Insurance and pay just £152 a year. You can rest assured you will receive second to none cover including cover against uninsured drivers, personal accident, vandalism and you're guaranteed a replacement car. In fact, the comprehensive cover at Saga Insurance received a 5-star rating by Dafaqto in 2016. Start browsing for your next policy and start saving today! When it comes to insurance, you can never be too careful and more often than not, it's those little extras which we turn our backs on that end up costing us in long run. So, In addition to the benefits which come as standard with a Saga Car Insurance policy, you can also choose from a range of additional cover options including discounted Saga breakdown assistance, breakdown repair, legal protection, replacement car extension, Increased personal accident & accident healthcare. Of course, it's up to you which policy best suits you but it is most definitely worth giving the additional extras a look in whilst selecting your next policy! 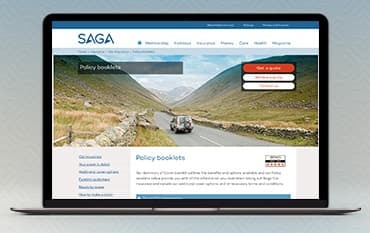 If you're already an existing customer with Saga Car Insurance, it is now easier than ever to view your policy documentation online, renew your policy or make a claim! Who will repair my car in the event of an accident? It is vital that you advise us of any changes immediately, otherwise any claims might not be covered. Please call us on 0800 056 9173 for advice or to notify us of any changes. Can I add another driver or a temporary driver to my policy? Designed specifically for the over 50's, with Saga Car Insurance, you can guarantee high-quality motor insurance covering all purposes. This can be paid via regular monthly payments when you purchase cover online, making things easier for you! Saga Motor Insurance even provide cover for when driving in the European Union with no extra costs. Make sure you find the perfect deal for you and your vehicle with leading specialist, Saga Car Insurance.